The Steamboat Arabia that sank in 1856 had a shipment of jaw harps -- also known as "Jew's Harps" -- as part of its cargo. Unfortunately, we did not get a picture of the artifacts there. The entire shipment, because they were made of iron, had rusted into one single block inside the shipping box. But, the shape of the individual instruments was easily seen after the mud was washed out. The package for these jaw harps gives instructions for playing which are much easier to demonstrate than to describe. The pitch of the vibrating harp is changed by inhaling or exhaling and by the shape of the player's mouth. Pictures that show how to play will have to be part of a later revision of this site. 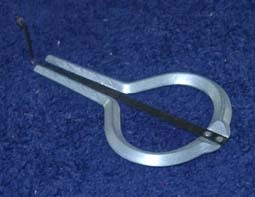 But, if you want to know what a jaw harp sounds like, they are the twanging sound in the background on some westerns.